All hail Josh Perkins, Prince of Park Hill! While a 3-0 record was expected for a team fresh off of a Final Four run, there were still plenty of questions regarding how this Gonzaga team was going to get it done. Here are some early storylines from the Zags' three-game homestand as they tooled up for their big non-conference slate. In this early season, Josh Perkins has shown an assertiveness that we hadn't seen from him in his first two full seasons. His three-point shot attempts have nearly doubled from last year (going from 4.2 to 8.0 per game) while improving to a 45.8 shooting percentage. Credit goes to him for hunting his shot, but also knowing where his bread gets buttered. Perhaps two-thirds of Perkins' makes from beyond the arc come from the right wing, the spot he often finds the ball during some of the Zags' elite ball movement. 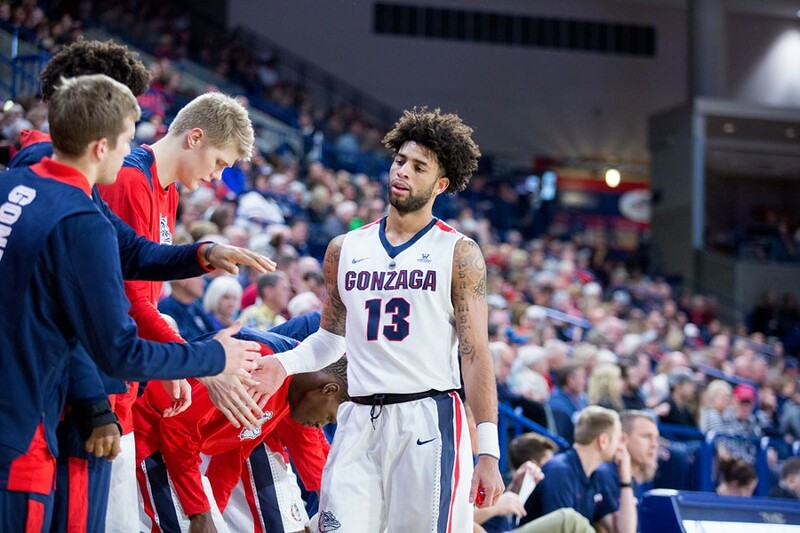 It's been agreed upon that for the remainder of his time as Gonzaga's chief ballhandler, that the right wing be referred to as Park Hill, the domain of Josh Perkins, Prince of Park Hill. Speaking of wings: boy, does Gonzaga all of a sudden have a lot of them. Since the "Decade of Excellence" has grown to become a double decade of excellence, the increase in caliber of recruits and player development has not gone unnoticed. While a fun bar-rail debate can be found in whether Gonzaga is a guard or big-man mill, it was safe to say that the wing position was never the program's forte. In a Gonzaga system, the wing often was an undersized guard or a glue guy, out there for defense and fighting for 50-50 balls. Now, the wing position appears to be the team's deepest. Freshman Corey Kispert rebuked initial estimates of an "early guy off the bench" role and has been a surprisingly steady hand, starting and playing major minutes. The 6-foot-6 small forward does not have the body, nor the game, of a freshman, as he's averaging 11.7 points and 6 rebounds. But Kispert isn't alone, with sophomore Rui Hachimura and junior Jeremy Jones more than capably filling in the position. Hachimura, college basketball's equivalent of the '60s British Invasion, if you go by student-section shrieks when he enters the game, continues to be a walking highlight reel. While he still has a ways to go in terms of the mid and perimeter game, watching him play in transition is best paired with popcorn. Jones' progress is an underrated story at this position. The junior who transferred after a freshman season at Rice as a basketball player and starting quarterback has made noticeable progress during his time in Spokane. He's a vocal defender locking down his guy while reminding others of their assignments, and he's averaging nearly a steal and two rebounds in a limited 10 minutes per game. Gonzaga University kindly asks that you don't help turn their program into Louisville, USC, Miami or SMU; thank you in advance. Last year's run to the title game earned the Kennel a brand-new banner that was showcased at Kraziness in the Kennel, as was the sweet new Jumbotron that now hangs at center court. Now, as guys go through their pre-free-throw-shot idiosyncrasies, you can catch yourself slowly getting distracted by their player introduction B-roll of them mugging for the camera. Speaking of which, I believe there's something to the idea that you can tell a program's place in the college basketball universe simply by their player introductions before the game. The Pangos-Bell-Karnowski-era Zags had a sort of '90s Chicago Bulls vibe of blackened stadium, contrasting with haphazard strobes and wiggling logo court light projections that was captivating, while a bit garish. This year's roll call is a bit easier on the eyes, while offering the extra panache of fog machines on the basketball standards. Talk about making the scene. 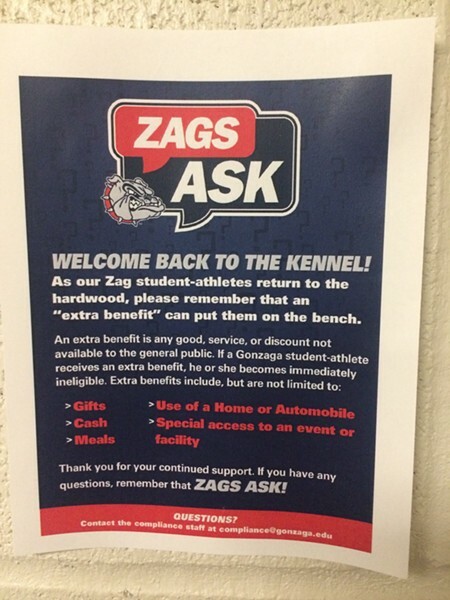 But perhaps the most noteworthy new addition to the Kennel experience are the newly added and somewhat subtle "FANS AND BOOSTERS: PLEASE DON'T COMMIT AN NCAA INFRACTION" public service announcements, both throughout the game and posted in the bathrooms. At least once throughout the game, public service announcer Kevin James will ask a fan a conduct question — with four possible answers — about how to interact with Gonzaga student-athletes in public. One of the options is harmless. Three of the options will result in scandal! It's a concerted effort to help the burgeoning program combat the consequences of being one of the majors in the college basketball landscape. Think of it like a Roman Catholic cross and holy water, warding off the evil spirits of overzealous shoe companies and Rick Pitino.